How many times have you heard those words? Whether you’re a student or a full-time staffer, it’s inevitable. We sit. A lot. It can be frustrating to find yourself hunched over a computer day after day, cramming in exercise before you dash out the door in the morning or after your evening commute. Did you know that by incorporating strength movements and simple stretches into your daily schedule, you can tone, lengthen and even burn a few calories while you work? 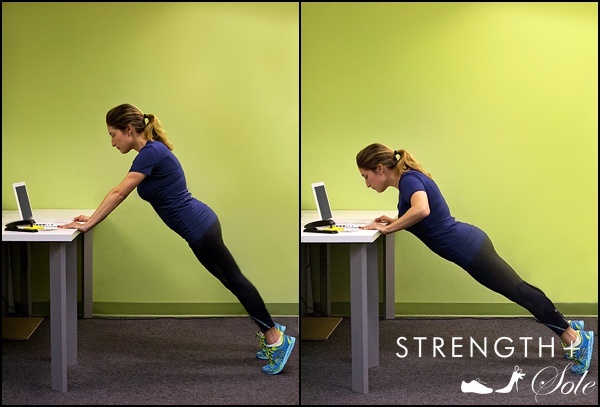 Start in an inclined plank position with your hands on your desk and feet on the floor, shoulder width apart, leaning forward. Slowly lower yourself toward the desk, keeping elbows tucked in to your sides. Extend out to the original start position, without locking your elbows. Do 3 sets of 8-10 reps as a mid-morning break. Sit in a stable chair with your hands next to your hips and your body positioned toward the front of the seat. Slowly lower yourself down to the floor while bending your elbows toward the wall behind you. Hold at your lowest point for a second, then push back up to the original start position, focusing on using your triceps. 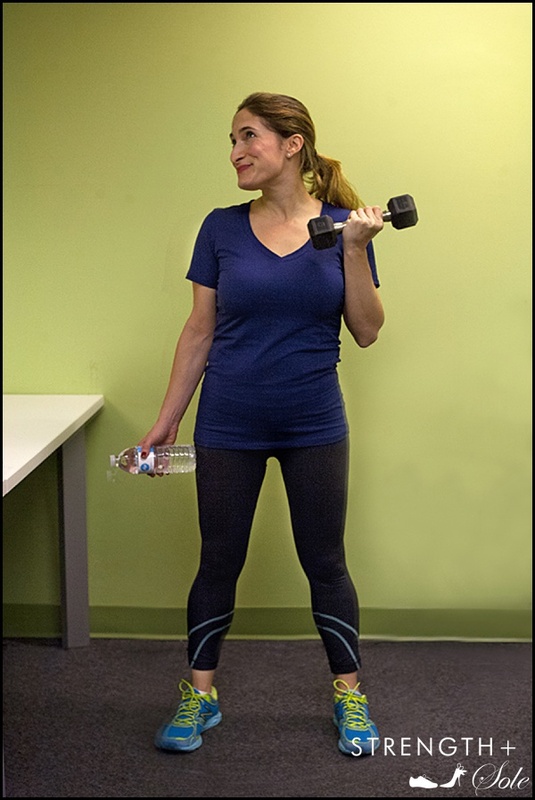 Do 3 sets of 8-10 reps.
With a weight (3-5 pounds or grab a water bottle!) in each hand, curl up and in toward your ear, one at a time, twisting your wrist outward, away from your head. Do 3 sets of 8-10 reps before you break for lunch. What you’ll gain: Defined biceps, taught triceps and strong shoulders. Hello, tank tops. Stand with feet shoulder width apart and arms in front of you. Slowly squat, keeping your back flat, until you lightly touch the seat behind you. Hold for 3 seconds, then, return to original start position. Do 3 sets of 12-15 reps. 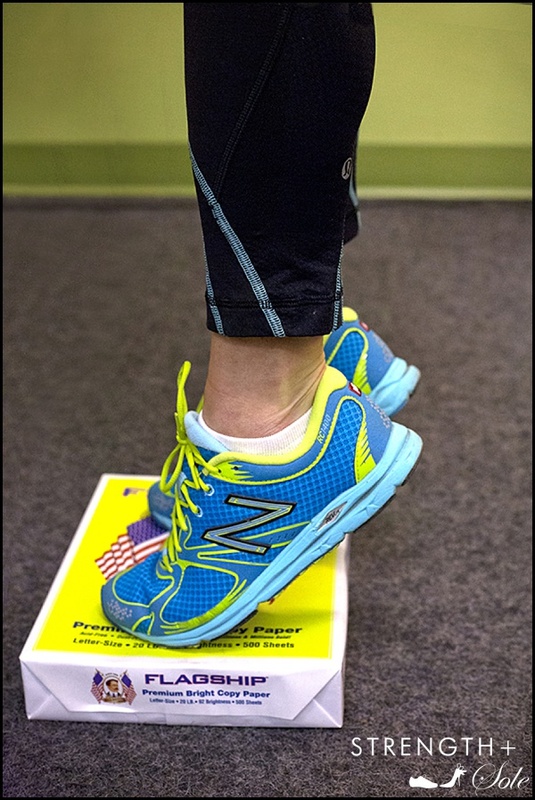 Stand with feet shoulder width apart (use a ream of paper for extra lift) and slowly raise your calves. Return to starting position. Do 3 sets of 12-15 reps, while waiting for photocopies to print. Stand with your back against a wall. Slide down until in a seated position and hold as long as possible. Return to starting position. Do 3 sets. You can do this while talking on the phone, no one will know! What you’ll gain: Sleek, sculpted legs that say “I work out.” Grab your high heels. Take twenty minutes to complete this routine a few times per week. Combined with walking, you’ll feel (and look) strong. Consider investing in an activity monitor (I love the Bowflex BOOST) to keep track of your steps and sleep habits. Knowledge is power, especially when it comes to fitness. Cory Vines tee; Lululemon leggings (similar here); New Balance sneakers. Photos by Roopa Bhopale Photography; shot at The Hive at 55, NYC. Yes, it is easy (and fun)! Thanks for reading. Get lower on that wall sit R! Amazing, thanks for spreading the word about STRENGTH+Sole!